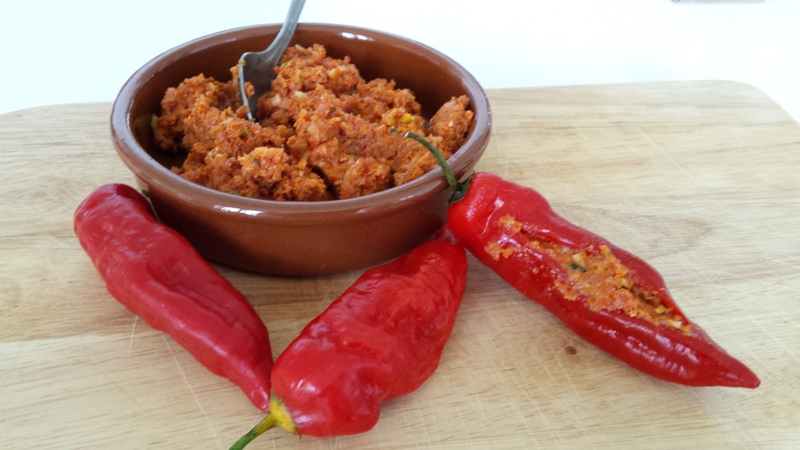 Put the Chorizo in a small hand blender and pulse into small pieces. Now add the rest of the ingredients (apart from the feta cheese), squeeze the lime juice and blend to a fairly smooth paste. Add the oil and give it a quick pulse to incorporate all into a spreadable paste. Add the crumbled feta cheese and mix thoroughly. Season to taste. Using a sharp knife make an incision length wise on each of the “Piment Cari”, taking precaution not to cut through the “piment cari”. Stuff the chillies with the chorizo and Feta cheese stuffing. In a frying pan, add 3 Tbs of Olive oil, once hot carefully put the stuffed “piment cari”. Turn the heat down and shallow fry, turning regularly to ensure the piments are fried evenly. Once thoroughly fried remove from the pan and set aside. Serve while still warm with a few more slices of lime. Serving Suggestion: Can be served as a tapas on its own, or served with fresh bread.